As a quick reminder, here are some photos of my great grandmother's shelves before I started working on them. 1. First up, I removed the two small drawers and the hardware on them. 2. Next, sanding, using the helpful sanding tool I described here. At this stage, I used the medium grit (120). The goal is to remove the glossy finish of previous paint coats and create a surface that your paint will properly adhere to. If you've got any gunk or bumps you want to get rid of, a higher grit can work, but it may leave scratches on the wood that you'll need to take out using additional rounds of lower grit paper. We'll also use the lower grit in upcoming steps. The sanding tool I used provided a hard surface to hold the sandpaper and was also easy to hold with a built in grip. However, you can also buy sheets of sandpaper at the hardware store and wrap them around a block of wood or something similar. The amount of pressure and rounds of sanding you need will depend on the type and amount of existing paint. Again, the goal is to create a good surface for your fresh new paint. 3. Then, filling holes, using a wood filler as described here. Depending on what type of furniture you're refinishing, you may or may not have much filling to do. 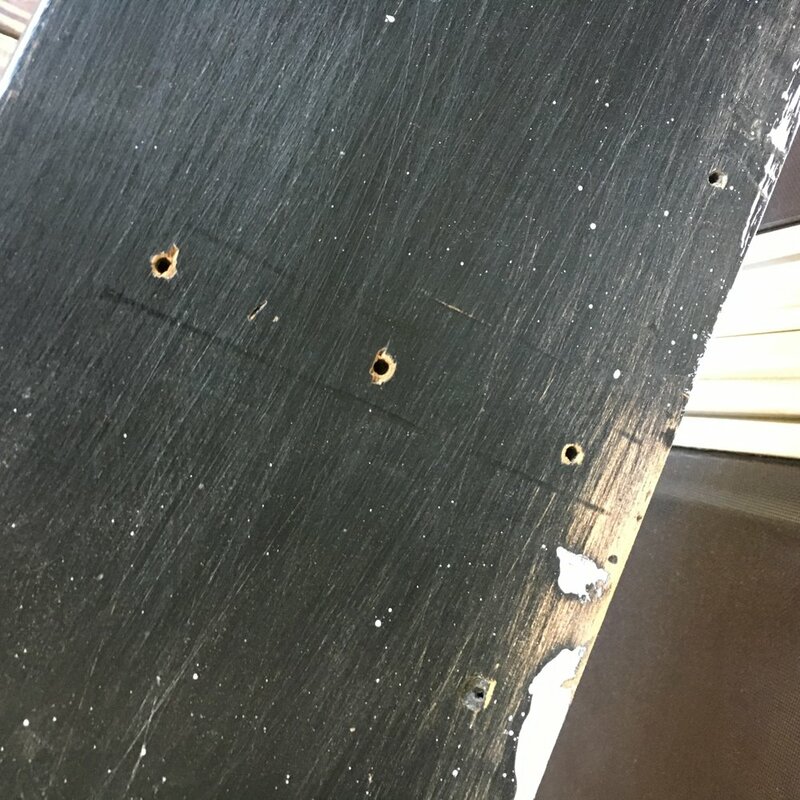 Reasons you may have holes to fill include: heavy wear and tear over time, damage, or holes from previous hanging/mounting tools. In my case, there was a little of everything, but mainly some nail holes that had been left from the the mounting system my great grandmother had used. Follow the instructions for the wood filler you selected, but essentially, you'll be filling in the holes and smoothing over the top. Don't worry about the variating in color if you're painting, it will all get masked by the primer and paint. 4. 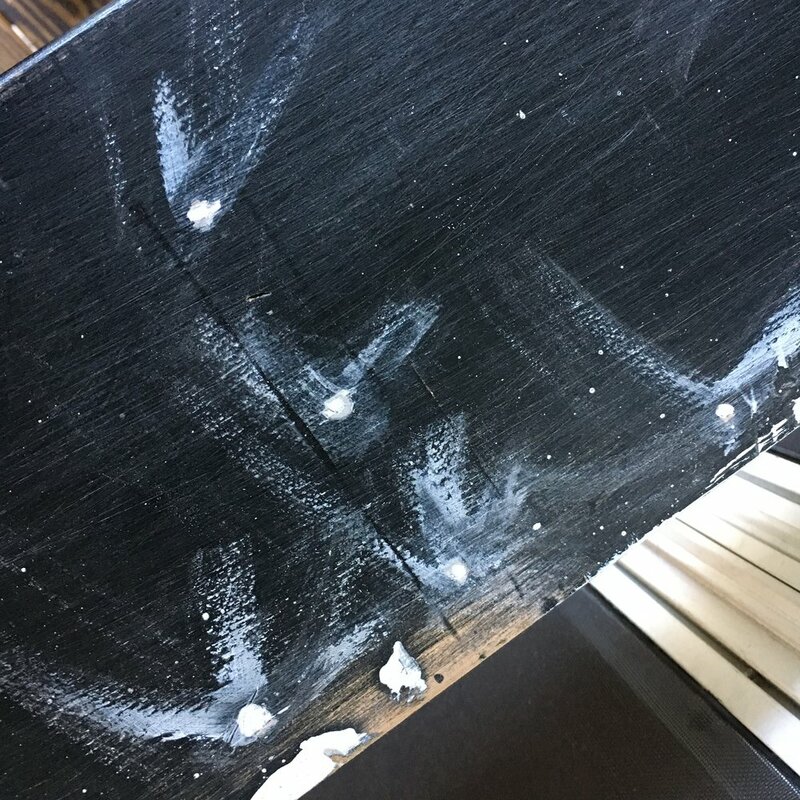 Finally, after the wood filler has dried, you'll want to sand over the filled areas to create a smooth surface and ensure that you won't notice the wood filler once your piece is fully primed and painted.